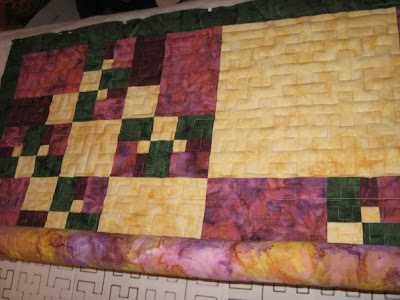 My friend, Karen, in Washington has nearly finished machine quilting Jeff's Fractal Quilt. I'm very excited to get it back soon! 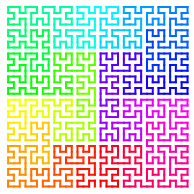 She quilted it with the mathematical Moore Curve, like shown here. Thanks Karen, it looks great! Here is a picture she posted on Facebook showing her progress: Here is a picture of the full quilt, before I sent it off to Karen for quilting. Earlier this week I finished hand sewing the binding on the second of the kids' quilts. Two down, one to go. I'll post pictures once I can find a place to lay them out. There isn't much space here, but we might be able to hang them for photos.